Kilofly is a company which specializes in manufacturing of finest quality fashion and lifestyle accessories for affordable prices. Kilofly is constanly searching for and developing innovative tools and accessories, keeping its clients up with the latest trends. Everything started with selling of purse hooks, but today Kilofly not only has one of the largest collections of purse hooks, but also offers products such as baby clothing, shoe accessories and kitchenware. Nothing stops with it, because Kilofly continuously introduces new products and designs for their consumers. Both hair cutting and thinning shears are made of stainless steel, ensuring durable, long-lasting and razor-sharp cutting edges. Cutting shears have razor edge hollow ground blades, but thinning scissors have two kinds of blades – micro-teeth and razor edge blades. Hair thinning shears have 28 micro-teeth which allow to thin the hair bulk in necessary sections. Both of hair scissors are 6.8 inches long, but total weight of whole kit is 11.2 ounces. Both cutting and thinning shears have tension adjustment screw, so they can be adjusted for desired tension. They have finger rests, but none of them is removable. They also do not have finger inserts which usually provide size adjustment and thus fit and comfort. It should be mentioned, that this kit includes a lot of elements, but storage case is not included. As mentioned before, both of these Kilofly hair shears are made of high quality stainless steel, therefore, they are silver color with polish finish for slight sheen. Both of them are ergonomically designed to ensure cutting precision and smoothness without causing any discomfort or distress to barber’s fingers, hands and thus shoulders. In this case ergonomic design means asymmetric handle and non-removable finger rest. They also have Kilofly logo in the area of tension screw. Cutting shears are intended for hair cutting, but thinning scissors are meant for hair thinning or texturizing. This Kilofly product is more suitable for amateurs and usage at home, but it does not mean that they have lower quality or performance. 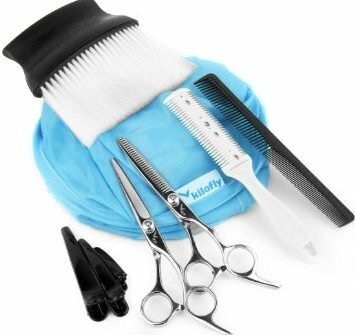 This Kilofly Hair Cutting Tools Kit includes such elements as cutting shears, thinning scissors, hairstyling cape, sectioning clips, razor comb, narrow wide comb and neck duster. Both cutting and thinning shears are made of stainless steel, but their blades differ from each other – hair cutting shears have razor edge hollow ground blades, but hair thinning scissors have razor edge and 28 micro-teeth blades. Both of these Kilofly scissors are 6.8 inches long, but total weight of whole kit is 11.2 ounces. Considering that they are made of stainless steel, they are silver color and they have that typical sheen. Both of these hair shears have tension adjustment screw and non-removable finger rest, but they do not have finger inserts and storage case. They are suitable for every amateur to cut, thin or texturize the hair at any time and any place.